Several outstanding flowered climbers come from the rainforests of Queensland. 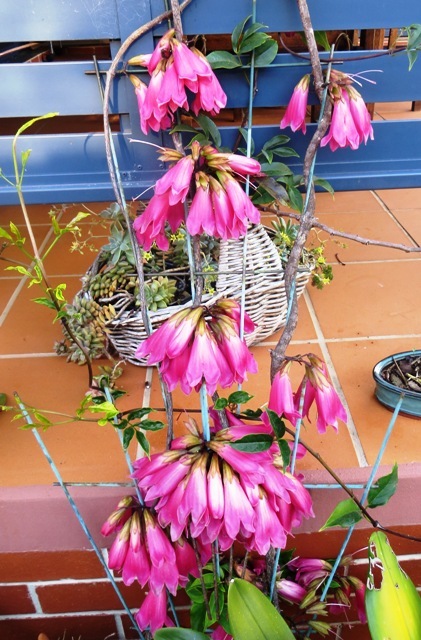 One of the most gorgeous but least known in cultivation is the pink trumpet vine, or Fraser Island creeper Tecomanthe hillii. This is a very well-behaved member of the Bignoniaceae family which has given the world so many beautiful climbing plants. Unlike its cousins the pandoreas, or the showy Orange Trumpet Creeper (Pyrostegia venusta ), or that other well-known trumpet creeper Campsis radicans (aka as Cow-itch or Hummingbird vine), Tecomanthe doesn’t grow too large or rampage too vigorously. It puts out only a few new twining stems each year and the small compound leaves with their five neat, shiny leaflets provide a light cover to fences, pergolas and other upright or horizontal supports. This makes it ideal for places where a denser, more vigorous vine would not be suitable. The dusky pink bell-shaped flowers are born in tight clusters, in spring. Flowering lasts several weeks and the climber still looks tidy and attractive all year even when not in flower. Tecomanthe is strictly a sub-topical plant but does well at higher, cooler altitudes in the tropics, subtropics and any place where cool-season temperatures don’t go below 32°F/0°C. Though it will tolerate these low temperatures for brief periods during its dormancy period, it does best where cool season temperatures are over 59°F/15°C. It grows well in light shade but will flower better if given lots of morning sun. Though not too fussy about soils, this climber does best in a light, sandy loam that contains plenty of humus. It won’t thrive in heavy clay and needs good drainage. Water regularly in dry weather, once established. This is a plant from a region where summers are warm and very wet and winters/springs are usually dry and cool, so take this into account when developing a watering regime. It will tolerate up to 90 days of drought; too much rain in late winter/spring tends to diminish flowering. Fertilizing is not really necessary if the soil is good; adding compost around the roots in early summer will give it an annual boost. If you want to promote better bud development use a light dose of a fertiliser high in phosphorus in late summer/autumn. Pruning is not necessary unless you want to restrict the growing tendrils. Mulch lightly with organic material in spring. Tecomanthe will do well in the pot because of its non-vigorous growth habit. Water regularly but sparingly and feed with a foliar fertilizer once every six weeks or so during summer. Don’t overwater or feed in winter. 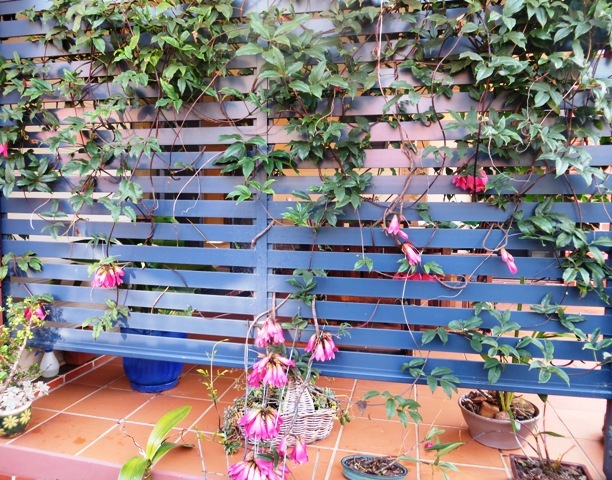 If you are looking for an attractive and unusual pink-flowering climbing plant then Tecomanthe – or Pink Trumpet Vine – is one that will get all your garden-loving friends and neighbours asking where you found such a treasure!